The excitement for the long awaited arrival of inexpensive Virtual Reality has been growing since the success of the Oculus Rift Kickstarter. Cadenza was one of the backers, and I've been experimenting with a Rift development unit for about a month now. It presents a fantastic view into game worlds, complete with a new set of challenges to overcome. The quality of the Rift device itself is very high for a development unit. It's origins as a cell phone screen taped to ski goggles is still apparent, but the solid plastic frame and quick setup go a long way to communicate that Oculus is serious about putting these in the hands of gamers. Importantly, it's comfortable to wear and can be used with headphones. The Rift is so lightweight that it's barely noticeable. Though after extended use and one's neck is beginning to feel the extra effort of looking around, it's understandable why Oculus is working to shave off grams. The most noticeable limitation is the low resolution. Spreading 720p over a wide field of view results in very large pixels. Oculus has already demonstrated a 1080p version at E3 this year, so it's really only a concern with these early units. The combination of low latency sensors and some fancy math behind the scenes results in very convincing head tracking. Testing on demos that poorly scale the view or buffer frames has brought on some motion sickness in minutes. But I've been able to play for hours in games with proper care given to their Rift integration. Experimenting with new demos can feel a bit like astronaut training. The SDK comes complete with source code and samples. Simple games could get up and running with the Rift in hours, while more complex games will require more effort to integrate. 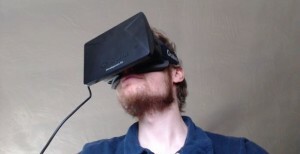 I'll go into detail on how we added Oculus Rift support to Retrovirus in the next post.